Kusems L. Poppington: Autumn is here! 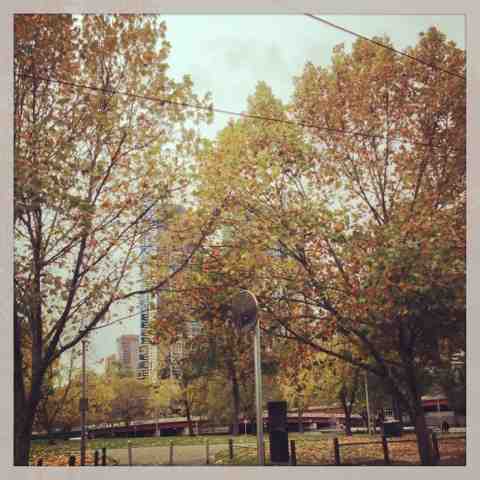 Autumn has arrived in Melbourne, and it's time I stopped fighting it. The weather here is very changeable, and while I've lived in similar conditions for most of my life, I've been spoiled by 9 months in Adelaide. In the past couple weeks, I've had to re-learn how to dress. Just because it's balmy and sunny right now doesn't mean it won't be raining and freezing cold in ten minutes. Don't leave home without a coat and a hat! I had to quickly knit myself a pair of hand warmers the other day cuz I realised I didn't have any gloves!